Welcome to Mohave Community College and congratulations on your desire to improve your quality of life through higher education. 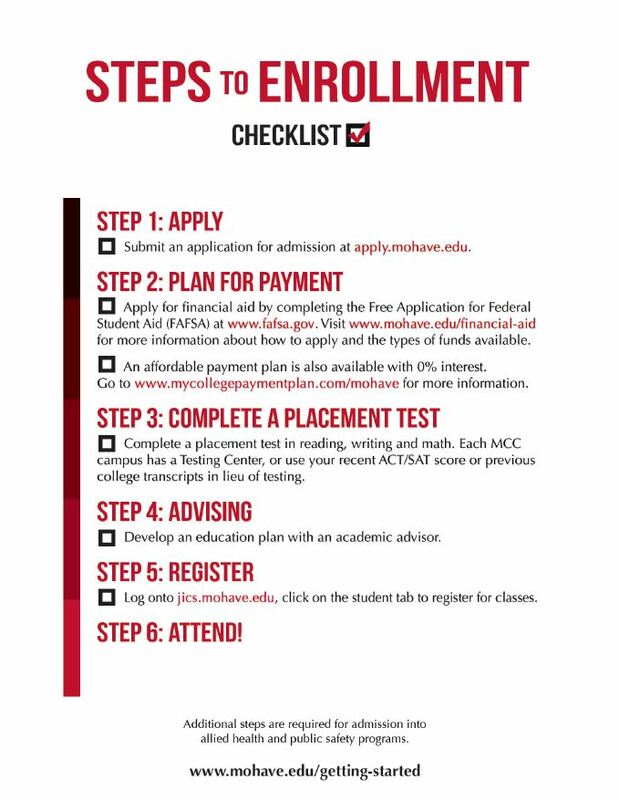 If you are a new student, or if you are returning after more than a one-year absence, you will need to complete the online admission form and provide evidence of U.S. citizenship/lawful immigration status, to be considered for in-state or Western Undergraduate Exchange (WUE) tuition rates or any Arizona state-based financial aid. This includes students enrolled in state grant supported adult education classes. To get started just fill out our free admissions application. Once completed, a confirmation will be sent to the e-mail address you provide, with instructions on how to proceed. If you have any questions please contact one of our admissions specialists listed on this page. You can also send us an e-mail or call 866.664.2832.